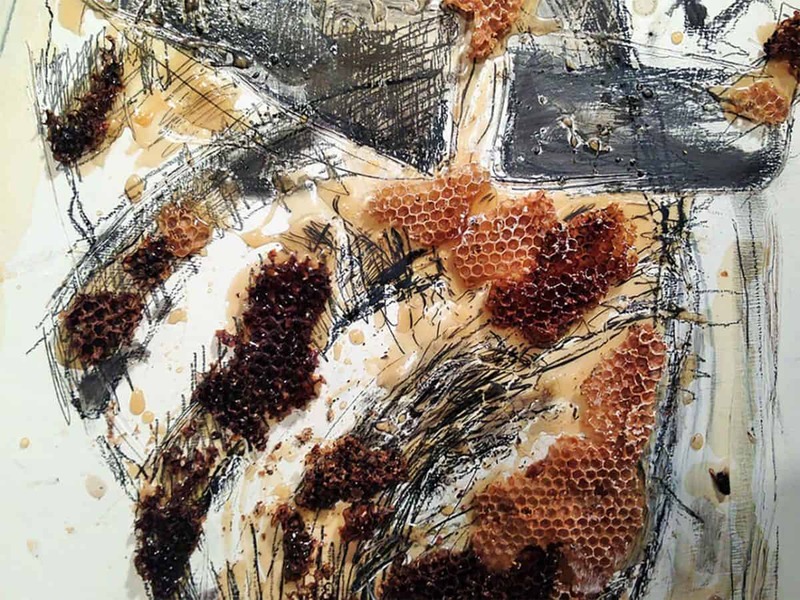 This October Duplex Gallery will host Craig Goodworth and his work, Kosť & Med (Bone & Honey). Working with raw and found materials, and the written word, Goodworth’s work explores central themes imbued with symbology while staying rooted in the natural world. In ecology, the boundary or transition between two distinct environments is referred to as an ecotone. Craig Goodworth’s practice straddles boundaries between animal and human, body and word, ecology and religion, art and life. These boundaries may be sharp or poorly defined, bleeding into one another. While this liminal space affords rich sources of nourishment, it is not always safe, obvious or familiar ground. He seeks through his art to see the world through the eyes of monks, farmers, loggers and activists. Raised in the American West, Craig Goodworth began his studies at the Maryland Institute College of Art where he devoted himself to classical academic sculpture. He returned to Arizona and began interdisciplinary graduate studies in sustainable communities, concurrent with a low residency MFA. His figurative interests gave way to working in a variety of media including drawing, poetry, and installation. Goodworth’s practice is concerned with the body, land and ritual. Currently based in Oregon, Goodworth, along with art-making, does farm labor and teaches a writing course. His work crosses disciplines represented by artist residencies in various contexts including an Eastern Orthodox monastery. Following a Fulbright to the Slovak Republic (2014-2015) he’s returned to central Europe, exhibiting and lecturing internationally. The exhibition will run 6th – 28th October at Duplex Gallery in Portland, Oregon. See the Facebook event page for more details.